Franklin senior Lauren McGrath has been selected as the HockomockSports.com Player of the Week, presented by Morse Insurance, for Nov. 4 through Nov. 10. McGrath is the 10th player chosen as Player of the Week for the 2018-19 school year. 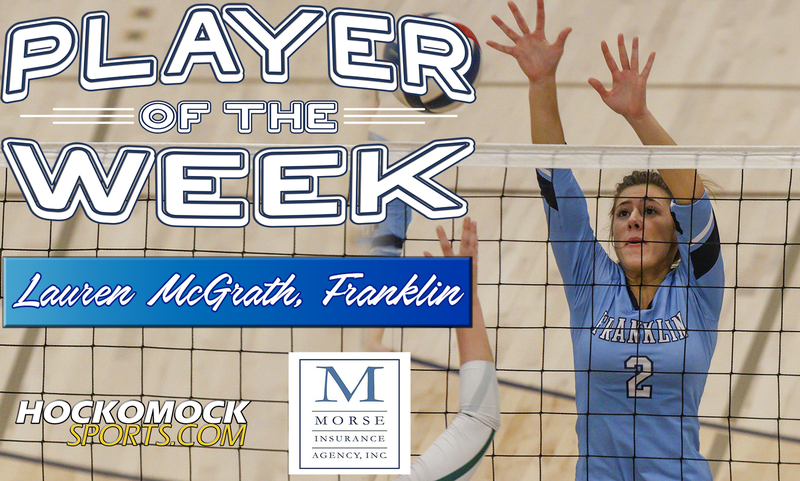 McGrath, a senior setter, was the key piece for a Franklin team that won three tournament games this week, all in five sets, to claim the Div. 1 Central/West title. It was the first sectional title in program history and McGrath was the fulcrum for the Panthers attack, spreading the ball around to Franklin’s array of attacking options, including a program-record 55 assists in the tournament opener against Concord-Carlisle. On Sunday, second-seeded Franklin avoided an upset bid from No. 10 Concord-Carlisle in a dramatic five-set victory. The Panthers won the opening two sets comfortable, but the Patriots battled back with narrow wins in sets three and four. Franklin pulled out a 15-13 win in the fifth. McGrath sparked the Franklin attack with a program record 55 assists. On Wednesday, the Panthers bounced back from a 2-0 deficit on the road at No. 3 Hopkinton, winning the final three sets, including 15-11 in the fifth, to advance to the program’s second sectional final. McGrath led the way with 42 assists, her second most this year. On Saturday evening, McGrath and the Panthers jumped out to a 2-0 lead against No. 4 Shrewsbury, only to be forced into a fifth set for the third straight match. McGrath (38 assists) was outstanding again for the Panthers, picking the right hitter for each situation, especially during a dominant 15-5 fifth set. McGrath was second in the league with 426 assists during the regular season.